Why Regulate Outdoor Wood Boilers? Emissions from outdoor wood boilers can sometimes cause air pollution problems when not sited, installed or operated properly. New state regulations have addressed these concerns by implementing strategies to reduce emissions along with siting requirements for new OWBs and operational practices for both existing and new outdoor wood boilers. The rule addresses the need for cleaner burning units, establishing emission limits that new outdoor wood boilers must meet beginning in April 2008. The Department is aware that some of the outdoor boilers are causing air quality problems in their neighborhood. Some existing boilers do not have the benefit of recent cleaner design changes that better reduce the particulate matter and hydrocarbons in their exhaust; some have been sited too close to residential buildings and may also not have adequate stack height to disperse their exhaust. Persons that have complaints about an outdoor wood boiler can report them here or they can call the DEP toll free in Augusta at 1-800 452-1942 or the nearest DEP Regional Office -- Presque Isle at 1-800 769-1053, Bangor at 1-888-769-1137, or Portland at 1-888-769-1036. When making energy choices, the first thing to do is to make sure that your home or building is tight and well insulated. Then evaluate the different home heating options and make a c hoice that suits your lifestyle and needs. Here are some useful sources of information. 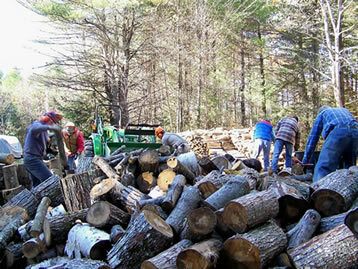 Since Maine allows the use of outdoor wood boilers year round, the EPA year round certification is referenced. Check the EPA List of Cleaner OWHH for updates. The efficiency reported in these tables are based on the year-round use of the boilers. Efficiency of most wood boilers is typically low when heat demand is low such as in the summer, early fall and late spring. The use of wood boilers to provide domestic hot water in the summer is not recommended. EPA Phase 2 White Tag efficiency rating is based on 8-hr burn rates for cord wood boilers and 4-hr burn rates for pellet boilers. These burn rates are closer to the maximum burn rate of the boilers and the 8/4 hr efficiency will usually be higher than the efficiency that the boiler will deliver over the span of a year. Use the Annual Delivered Efficiency to compare different types of heaters. Outdoor wood boilers which have not been tested and approved by the EPA Outdoor Wood-fired Hydronic Heater Program cannot be imported, sold or installed in Maine after March 31, 2009. Uncertified boilers which were in use in Maine before April 1, 2009 can be resold. 250 feet from property boundary. BTU : British Thermal Unit is a heat unit used to measure the heating capacity of most boilers and furnaces. Delivered Efficiency: A measurement from the EPA Outdoor Wood-fired Hydronic Heater emission test which is the percentage of heat available in the fuel that is delivered to a simulated heat load. Delivered efficiency does not account for heat loss through the boiler jacket or through heat transfer lines. A higher value results in more heat from the fuel wood reaching the building. Heat Input : The amount of heat energy that is contained by the fuel that goes into the heating device. Heat Output : The amount of heat energy that the heating device captures from the fuel that goes into it. This measurement takes the boiler's delivered efficiency into account. lbs/million BTU : A measurement of pollutant emitted for a unit of heat. Common among most heating devices. Heating devices which emit greater pounds (lbs) of pollutants are more polluting. A cord of dry hard wood equals about 22 million BTU. Outdoor Wood Boiler: fuel burning device designed to (1) burn wood or other approved solid fuels; (2) that the manufacturer specifies for outdoor installation or installation in structures not normally occupied by humans (e.g., sheds); and (3) heats building space and/or water via the distribution, typically through pipes, of a fluid heated in the device, typically water or a water/antifreeze solution. Also known as water stoves, outdoor wood furnaces and outdoor wood-fired hydronic heaters. Particulate pollution : A common type of pollution emitted by most heating devices. Particles are smaller than 10 microns and can cause harm to respiratory system.